When you hear the town of Concord, MA, you may not immediately think of beer or brewing. Concord is best known, especially among historians, for the shot heard ‘round the world, Henry David Thoreau, and Walden Pond. Remnants of a once prominent colonial town are still available for viewing, with several 300-year-old cemeteries and Minute Man National Park, which commemorates the origins of the American Revolution. On a cloudy cool day, famished, I knew I hit the brewery jackpot when I stumbled across a 1-bbl. nano-brewery inside a local restaurant. The view from the front entrance pulls you in with its cozy appeal, soft colors, wood beams, and kitchen-filled aromas. It has an open view concept that stretches from the brewery, all the way to the back of kitchen, in the space they occupy. It is without a doubt extremely inviting. 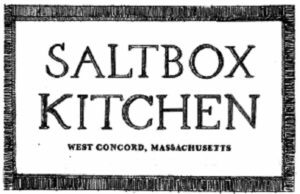 Welcome to the fine dining flavor, and the casual atmosphere called the Saltbox Kitchen in Concord, MA. Saltbox Kitchen proprietor, Ben Elliott, established the restaurant in 2015. He made the brewery part of the plan, courtesy of Ralph Fiegel and Dan Greroire, who are employees of the Saltbox. 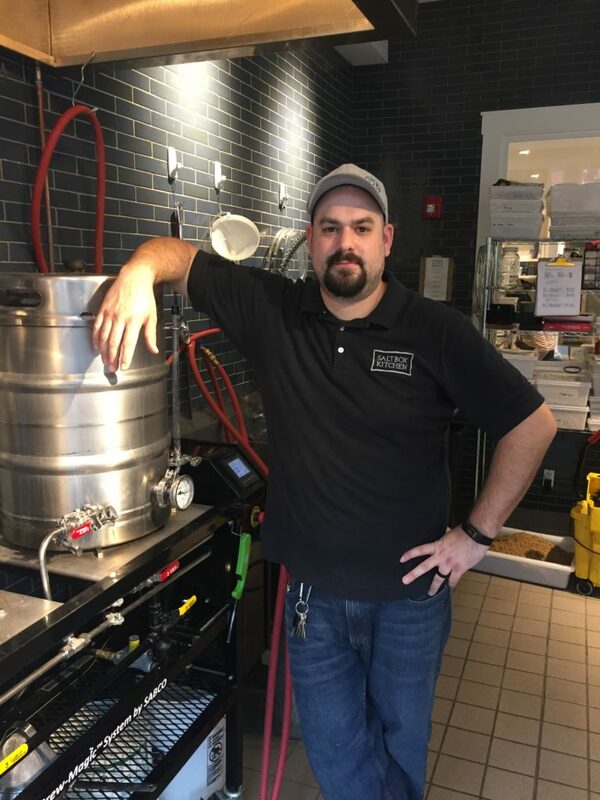 Ralph was the head brewer but has since shifted his focus to another soon to be brewery in Woodstock, CT. Dan, a Spencer, MA native, is now the head brewer and the Director of Operations of the restaurant. When Dan is not brewing, you can find him in the kitchen and rightfully so. The Gregoire family name has a long lineage in the food & catering business. If you lived west of Worcester, MA circa 1970’s & 80’s, you might have seen the Gregoire family truck, with its bounty of fruits & produce driving along the side streets of Spencer and the Brookfield’s. As a young kid, I fondly remember the elder Mr. Gregoire, allowing me to snack on a few grapes while parked in front of my parents home. Dan’s prior occupation as an Emergency Medical Technician was about as far away from the restaurant life as one could get. He left that profession and enrolled at the (now defunct) Le Cordon Bleu College of Culinary Arts in Boston in 2013. Although he admits he liked the adrenaline-filled days of being an EMT, he knew it was not going to be a lifelong career. He vibrantly admits helping in the Saltbox kitchen, prepping for a day of catering, and brewing beer, his true passion. Upon my return to the Saltbox a few months later to be part of a brew day with Dan, I quickly notice his attention to detail. He is also very knowledgeable in the process of brewing beer and is profoundly versed with yeast strains and hop profiles. 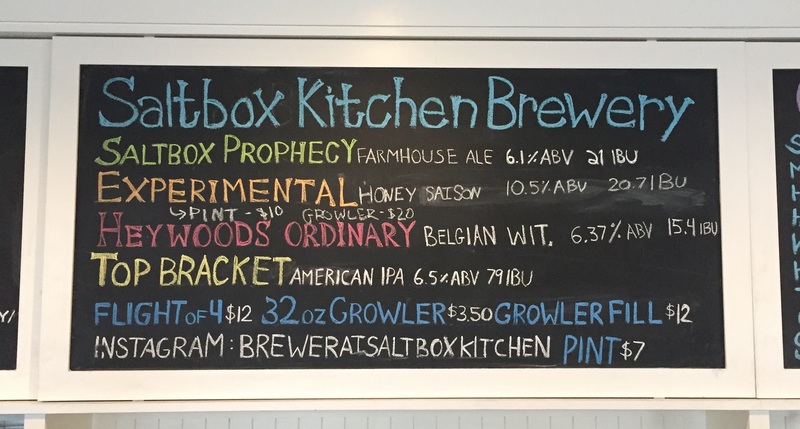 Dan, with his culinary background, likes to experiment using other ingredients (fruits & spices) to put a little twist on their Saltbox Brewing experimental series of beers. The first beer the brewery created, called Saltbox Prophecy, is a spot on and very drinkable 6% farmhouse ale, and is their flagship beer. It has the dubious distinction of a bronze medal win at the Great International Beer Festival in 2016. Heywood’s Ordinary, a Belgian Witbier, is homage to a local historical reference. Edward Thomas, a Saison hopped with Saltbox Farm grown hops, pays respects to Saltbox owner Ben Elliott’s grandfather. The Saltbox Kitchen is a farm to table restaurant. 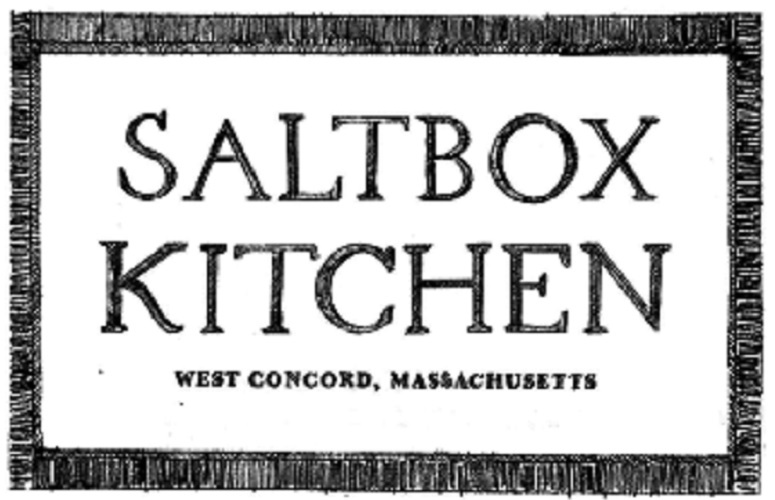 The Saltbox Farm, where many of the ingredients are grown, is also located in Concord. They typically have three or four menu paired beer dinners throughout the year. Having attended one myself, they are absolutely an amazing event and lots of fun. Their next menu paired beer dinner is on January 19th called ‘Brewed for a Cause’. $20 from each ticket sold is donated to the Veteran Support Alliance. This non-profit, volunteer, very worthwhile cause improves the lives of Veterans by providing clothing and food. 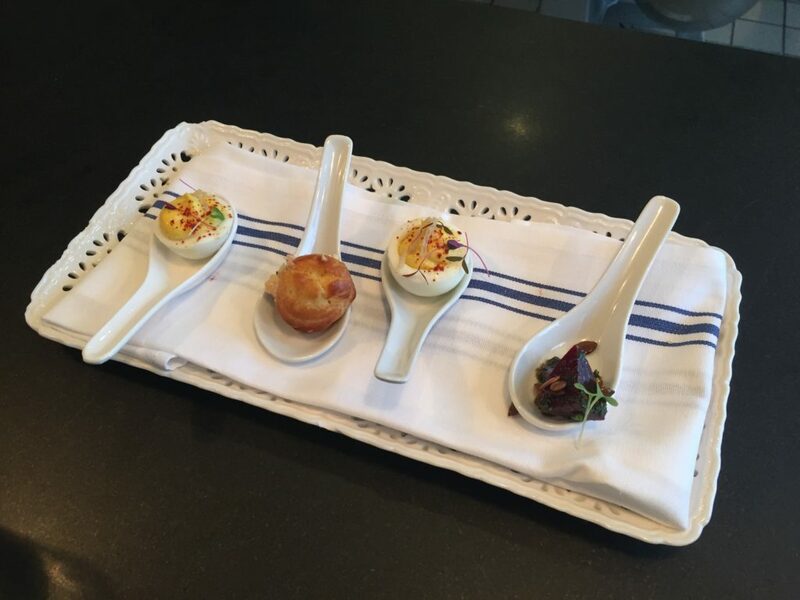 Your experience at The Saltbox Kitchen will be one of the best. With a super friendly staff, great tasting food, and palate bending small batch beer, you cannot go wrong. 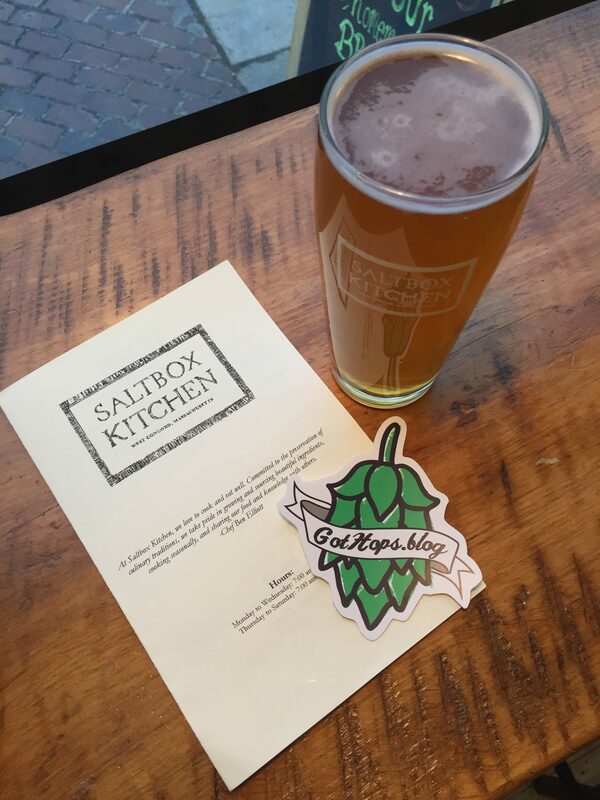 Don’t have time to stop in to tip back a Saltbox brew? No problem, you can get a 32 oz. growler of beer to go anytime the restaurant is open. Click the link below for a complete gallery of pictures. 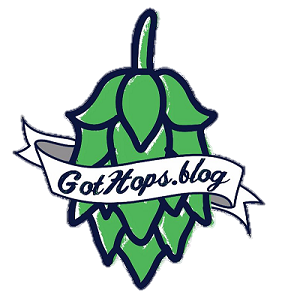 Feel free to use and share but please give proper credit to Saltbox Kitchen and GotHops.blog. You can also find my other posts and pics on Twitter, Instagram & Facebook.